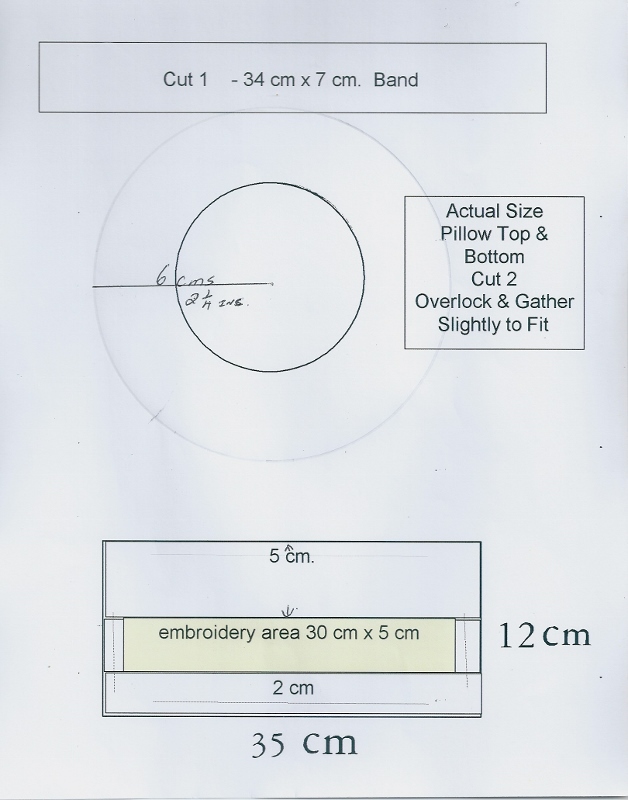 Materials: Equipment – Embroidery Hoops 100 and 150 mm. Chenille - Size 22 and 20 Crewel - Size 8 Beading Needle. Pellon, Wadding and Sewing Thread. 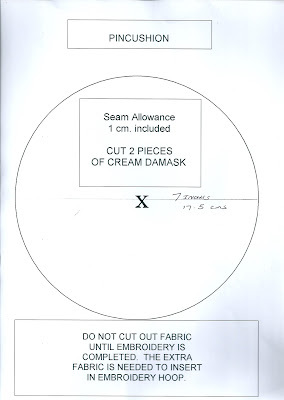 Cream Damask, Backing Fabric, Felt, Plastic Insert. Gold 4 mm. For Fern, Burgundy 4 mm. 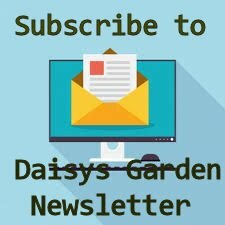 For small daisy. Threads: Teal – Lazy Daisy Leaves and Vine plus Pincushion wrap. 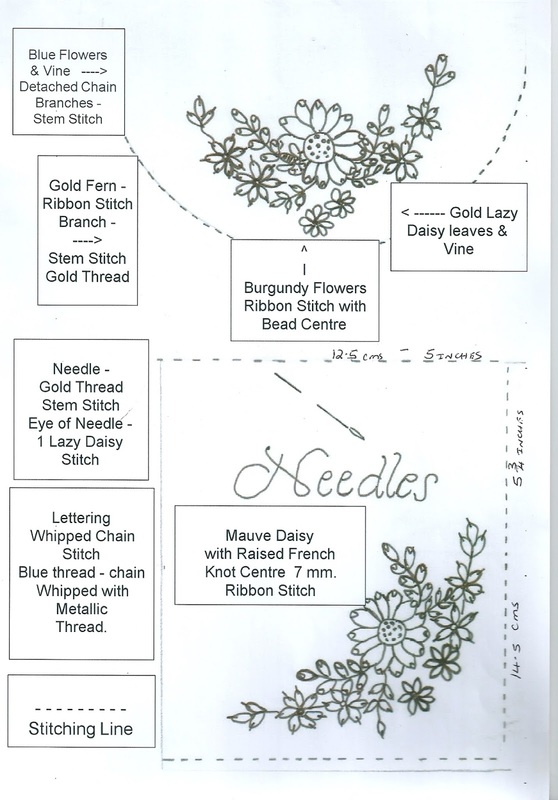 Teal and Gold thread also combined for French Knots in Large Daisy. Gold for Fern, Metallic Gold thread for Needle. Beads: Yellow Glass Beads for Teal Flowers, Bronze for Small Daisies. Buttons: 3 – Self Covering Buttons for Pincushion and Book. Charm: 1 – Bee Charm for Pincushion. otherwise it makes it too difficult for stitching. smaller hoop and mark with a water erasable pen ( 2) circles 1 cm. Diameter. knots ( best to have double thread for strength). 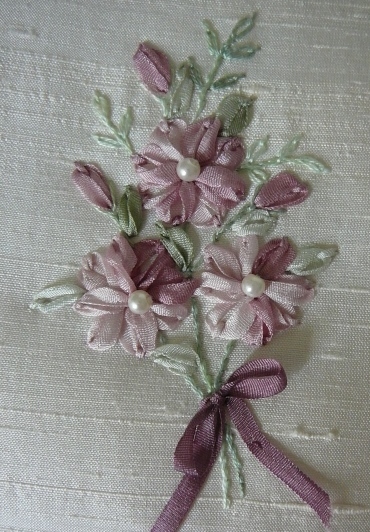 have completed the other ribbon embroidery. 1. First work the gold stems in Stem Stitch and Lazy Daisy Leaves. Lazy Daisy Stitch for the eye of the Needle. attached into the larger hoop. Progress to the ribbons. in a circle. Place a bronze bead in the centre when finished. then add the yellow glass beads. 2. Continue with the Gold Leaves in Ribbon Stitch. in a circle around the centre marking. ( The Cosmos Tutorial will aid in positioning each petal). to match the mauve ribbon so the stitching will not show. Cut out all pieces of Damask and backing Fabric. Turn back to right sides out. Fill with fibre fill or wadding. are satisfied that you have enough filling. Keep in mind that the cotton will push it down slightly. keep the thread firm as you go. Tie off firmly at the Centre Back. using a double strand of Sewing Thread. Cut Plastic to inner measurement 14.5 cms or 5 3/4 inches. This may need to be trimmed slightly. 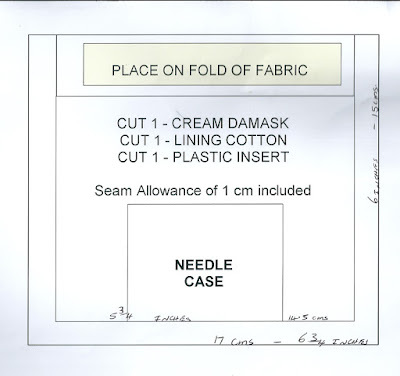 Insert the size of Fabric and then cut into 2 pieces, rounded at the edges. button to keep it closed. 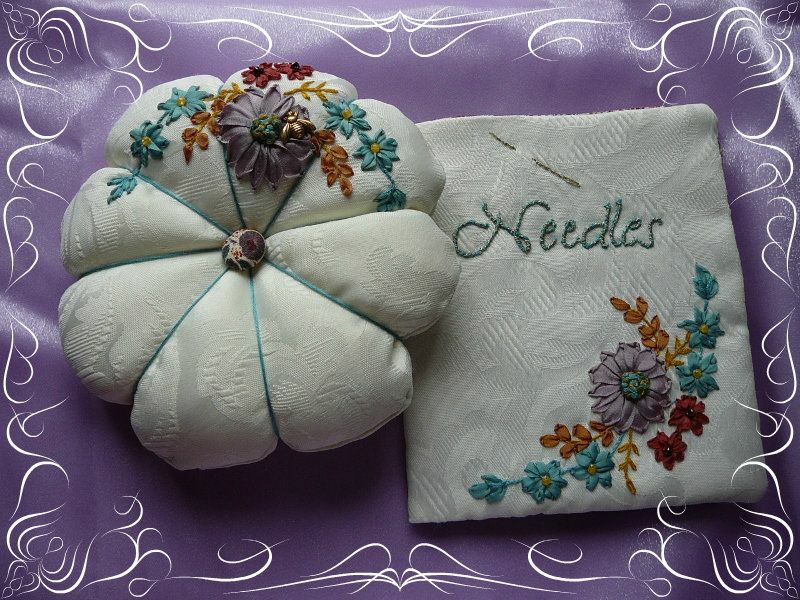 Stitches Used: Stem Stitch, Lazy Daisy, Ribbon Stitch and French Knots. 150 mm. ( 6 “ ) Hoop. Silk Dupion, Panne Velvet, Braid, Plastic insert and backing fabric. 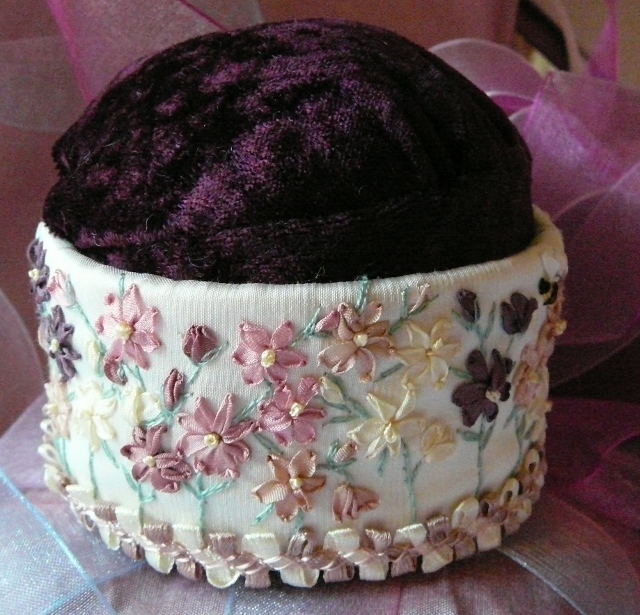 Sewing Thread, Wadding and Pellon. Ribbons: Assortment of 4 mm. 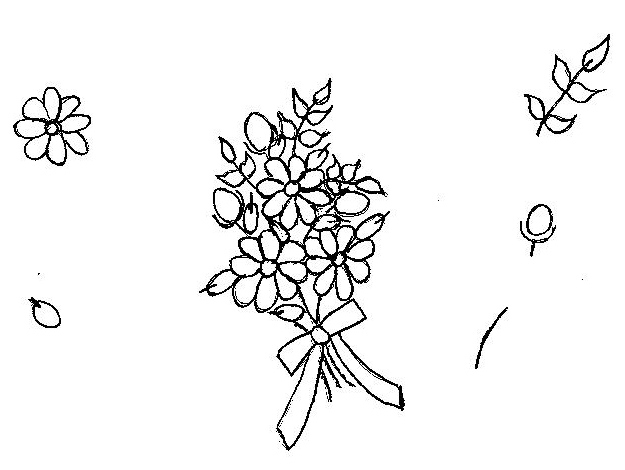 Ribbons for Flowers and Bees. Dark Yellow for body of Bees, Black for Bee Stripes, Eyes and Stinger. this in the hoop. Using tacking stitches add this to the back of your fabric. With a chalk or water erasable pen, mark an area of 30 cm. Long and 5 cm. High for your area to embroider. top of a needle and lift it slightly, you will see the petal tip come back up. French Knots in the paler yellow, 2 strands and doing 3 wraps. Fabric In Hoop – Ribbon Stitches and French Knots. 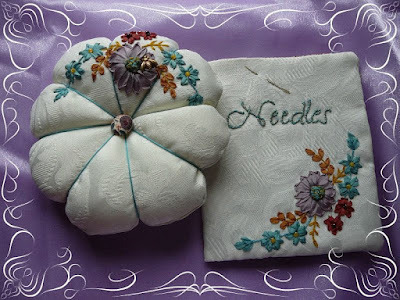 Fabric out of Hoop – Lazy Daisy Stitch, Stem Stitch and Satin Stitch. 2 small Ribbon Stitches in a V shape. ends. Close over with small slip stitches. stitch. 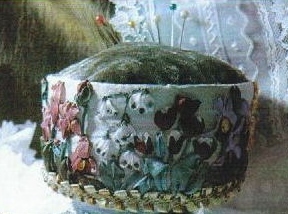 Place inside the Embroidered Ring. Folded Ribbon Stitch and Twisted Ribbon Stitch. 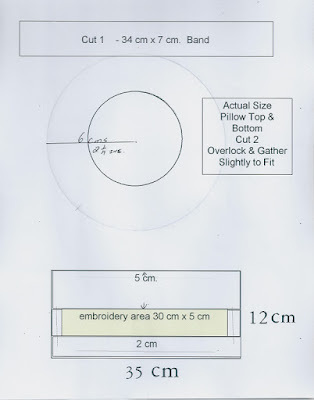 – 100 mm ( 4 “ ) Embroidery Hoop and 15 cm. Dupion Silk and Panne Velvet, braid, plastic insert and backing fabric. 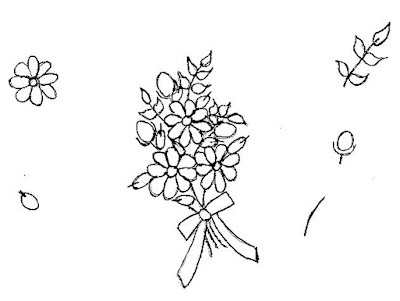 Stems( as illustrated ). Discussed in detail in the Instructions. Threads: Green Thread for Snowdrops. need the extra fabric to allow you to insert the material in the Hoops. 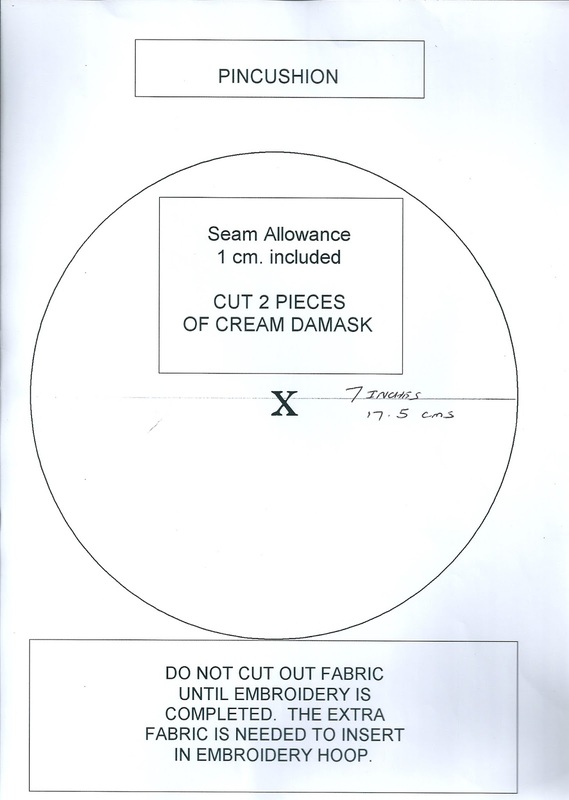 I have had to cut the pattern into two to illustrate. shape altered a little by twisting the ribbon at times. coming up from the Centre and taking it down into the Lower Petal. of the other flowers and leaves. Folded at the base of the bulb. Jonquils over the stems at places to make it more realistic. 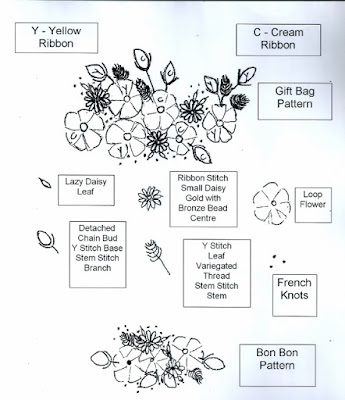 Leaves: Are Long Straight Ribbon Stitches placed from the Base. TULIPS: For two tone tulips. Work 3 Ribbon Stitches in the lighter colour first. Leaves and Stems : Worked the same way as the Irises. 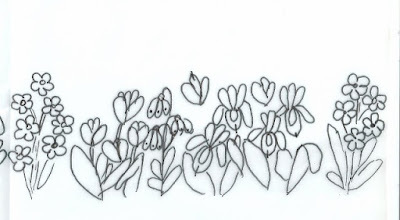 SNOWDROPS: Using 1 strand of the Green Thread, Stem Stitch the stems of the flowers. a small calyx at the top. Can be used as a set or individually. Silk and Lining 50 cm x 22 cm. Bag 24 cm x 18 cm. Bon Bon 20 cm length. 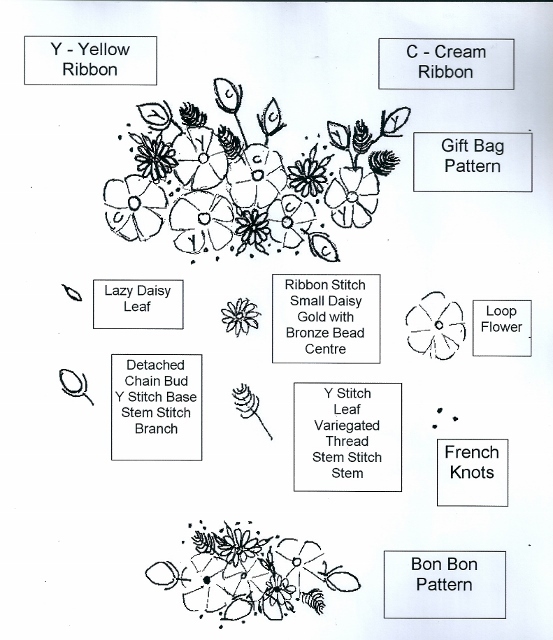 Y Stitch, French Knots, Lazy Daisy, Y Stitch Leaf. Hoop, Pellon, Sewing Threads, Fillings for Bag & Bon Bon. this. When completed stitch on a bronze bead. Next step, with 2 strands Cream Thread work the Lazy Daisy Leaves. The Fly Stitch Leaves are next with 2 strands Variegated Green Thread. 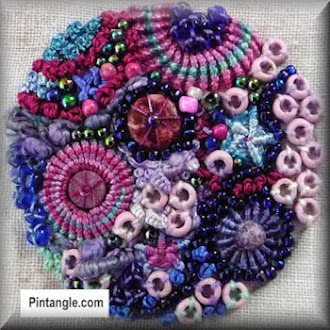 increasing the size as you go to shape the leaf, complete the stem with Stem Stitch. Variegated Thread and Stem Stitch the branch. Once you have completed all the buds. with 1 Thread of the Bronze Metallic. to trim the pellon back closer to the embroidery, but take care not to cut the fabric. side. Wrong sides together of the Lining stitch down one side with 2 cm seam allowance. into a roll or fill with potpourri. Allow 10 cm each end. Fold the ends back to have it 5 cm. few drops of fragrant oil. Tie both ends with an Organza Bow. 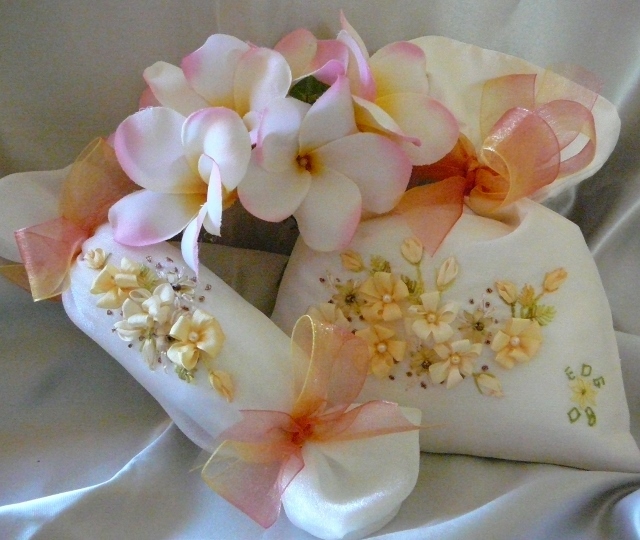 Gift Bag Design Width 11 cms. Depth 7 cms. Bon Bon Design - Width 8 cms. Depth 4 cms. 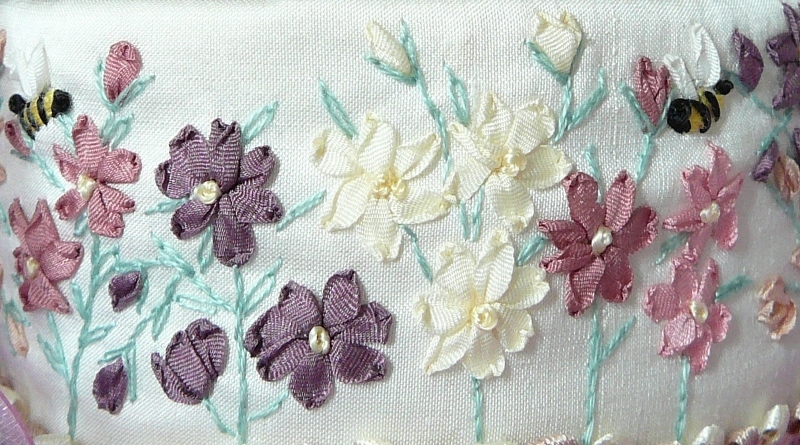 with 1 very simple stitch to complete the flowers. 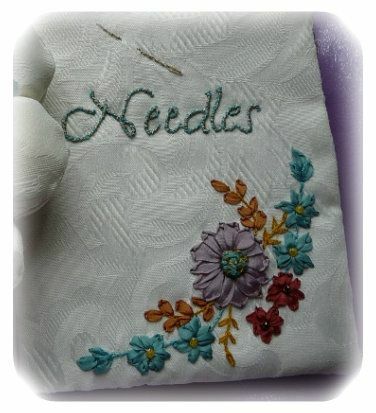 Stitches Used: Stem Stitch, Lazy Daisy Stitch, Detached Chain Stitch. Cottons: Green embroidery thread from stems and fern. Instructions: Transfer design onto material of choice with water erasable pen. 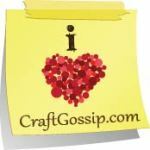 a piece of wadding larger than your hoop and tack this onto the embroidery area. This is needed to stitch the ends of ribbon down and also helps while embroidering. good work can be wasted. 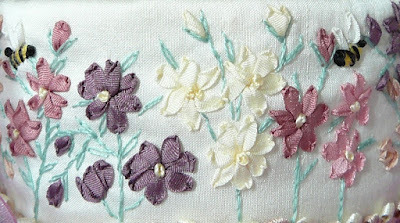 Using only 1 strand of the green cotton embroider the stems and fern in stem stitch. Also lazy daisy stitch for the leaves of the ferns. It is important when cutting the ribbon do not leave the lengths any longer than 30 cm. I prefer to cut between 22 – 25 cm. Any longer and the ribbon will fray towards the end. buds in detached chain stitch. through from the front and back out again and tying in a bow. Full length of this 8.5 cms. Width is 5 cms. This link maybe of help to you Detached Chain. 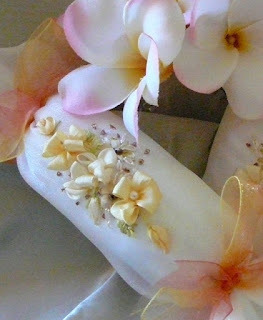 I am sure you will see many possibilities for this Flower Corsage.